All my website and graphic design clients have come through word of mouth which makes me very happy because it means that people like what I do! 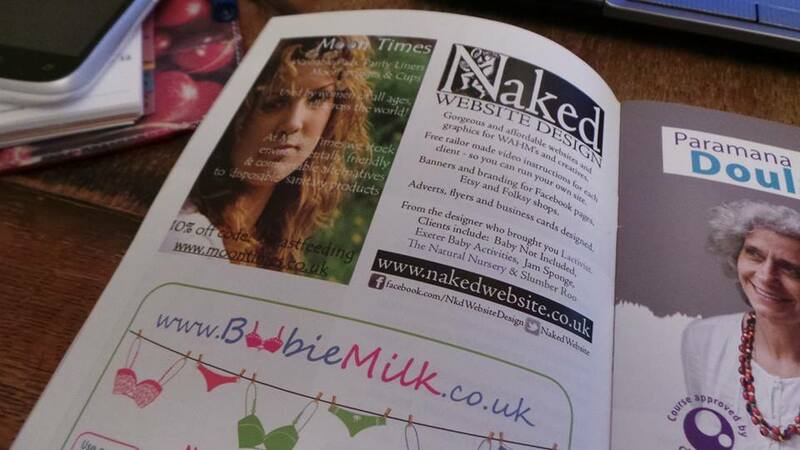 I had a bit of advertising space I had already paid for in the La Leche Leagues publication Breastfeeding Matters this month. It was going to be for a Lactivist advert but since I am closing shop to concentrate on design more I thought I’d try an advert for Naked Website instead. I specialise in small companies, work at home mums, artists and other creatives and I know that many breastfeeding mums fit into those categories – I did myself when I set up Lactivist. So, here is my first ever advert! I’m proud to be next to 2 sponsors of the support side of Lactivist too, Moon Times, run by Rachael Hertogs who’s site I built a long time ago and Boobie Milk who used my design for the Keep Britain Breastfeeding Campaign. Beautifully designed and functional websites need not be out of the reach of people who work from home. I love the idea of a super rich client with money to burn, but I get more of a hit out of making the best out of peoples budgets and enabling them to take control of their own sites, so they can save money. I can also help your adverts and flyers look amazing if you have a fully formed idea that just needs a professional tweak or are a bit stuck, I can help. If you want to ask me about website design or graphic design costs please just drop me a message. A chat costs nothing and I’d never try to sell you something you don’t need – it’s just not me!